I have been in love with the art of quilling for quite some time now and itching to do a blog post on it! While I am clearly not a professional, I thought I would share my artistic quilling adventures over the holidays. 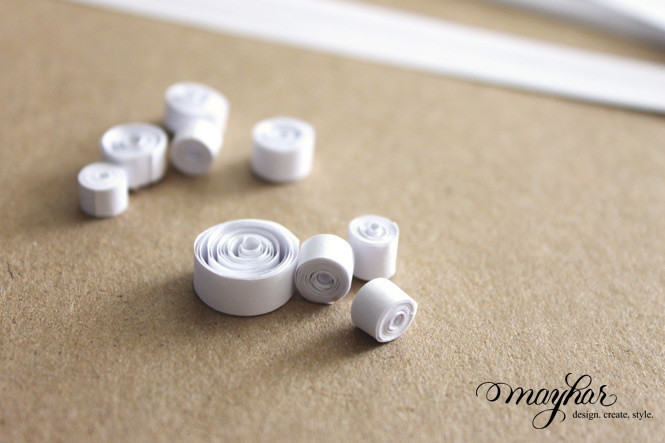 For those of you that don’t know, quilling is basically the art of rolling very thin strips of paper into tiny rolls or circles. While my version is extremely simple and basic, the art form can be incredibly intricate and beautiful as experienced quillers manipulate the rolled paper in various ways. I encourage you to explore some of these beautiful creations that are much more detailed than my own! But for today, I wanted to use a bit of it for as an accent on a homemade card. I have been making cards for years, as I have always loved crafting with paper! I love experimenting with multiple shades of paper and love adding layer upon layer. Here is a quick lesson on card-making based on the card above! (1) Start with your card base. Simply fold your card stock in half and press the crease down firmly. (2) Once your base is set, I always like to add one additional layer. It adds a nice level of detail and makes the card look more complete. Simply cut out 2 additional pieces of paper that are about half an inch smaller than the folded card. To make the measuring easy, pick your second layer of color in 8 1/2″ x 11″ paper. Fold it in half and cut along the crease. Then, cut 1/2″ off the top and one side. You should now have 2 pieces of paper that, when centered on your card, have a 1/4″ border. Add double stick tape to the corners and place one piece on the top of the card and one on the inside where you will write your message. I often use white as my inside layer, and then a corresponding or complimentary color to the front of my card. For this card, I used a tone on tone cardboard neutral. (3) Ok, once that is done, you can decorate! 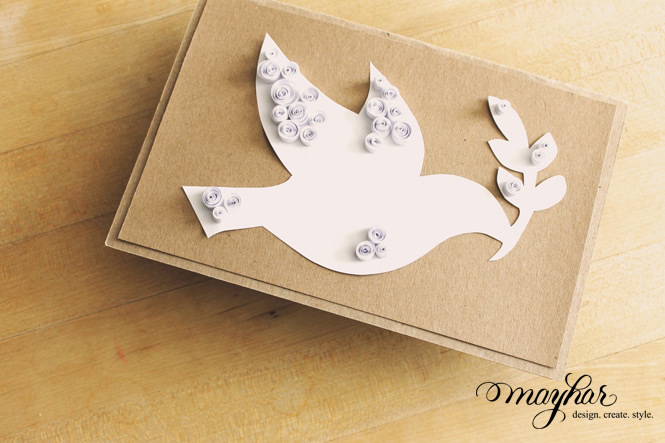 (4) I had intended to use quilling for my entire card, but was worried that the dove shape would be difficult to distinguish. Instead, I decided to cut out the shape and add quilled details. (5) I downloaded the shape I wanted, and quickly transferred the image to white paper and cut it out. Double stick tape is by far one of my favorite supplies, and I ALWAYS use it to adhere paper to paper, as it does not warp. If your paper is not thick enough, glue will cause wrinkling. 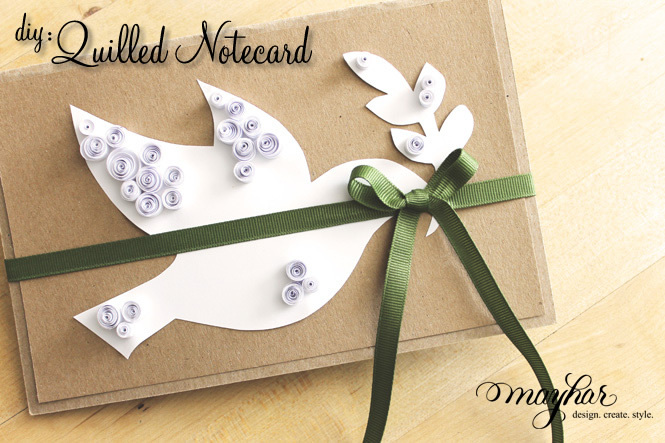 I added pieces of tape to the backside of my dove, making sure small strips were in each point and pressed it onto the card base. (6) Next came the quilling. As I mentioned earlier, you can use pre-cut strips or cut your own. I cut mine with a paper cutter to about 1/8″ to 1/4″ thickness. 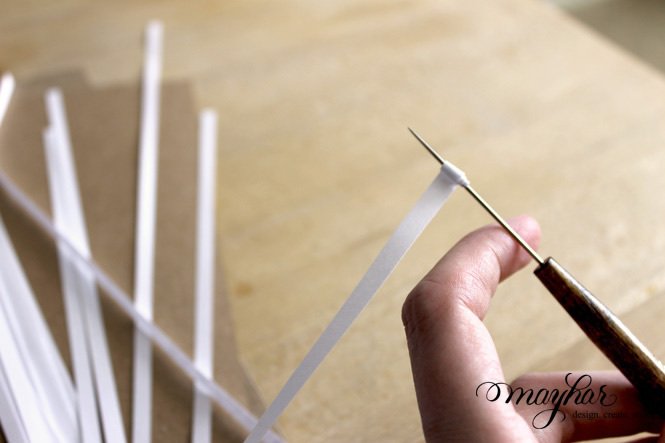 (7) Take the end of your paper strip and press it against the quilling tool’s needle. Holding it in place, twist the handle and continue to roll. It may take a little bit of practice, but is quite easy once you get the hang of it. The tool will allow you to get a very tight roll on the paper, but you are also free to use your fingers if you like. (8) Once you have rolled the whole strip up, dab a tiny bit of glue to the tip and press it against the rolled paper. For a tight roll, press immediately but for a looser roll, let some of the tension release so that there is space in between before gluing your tip down. I did a combination of both for my card. 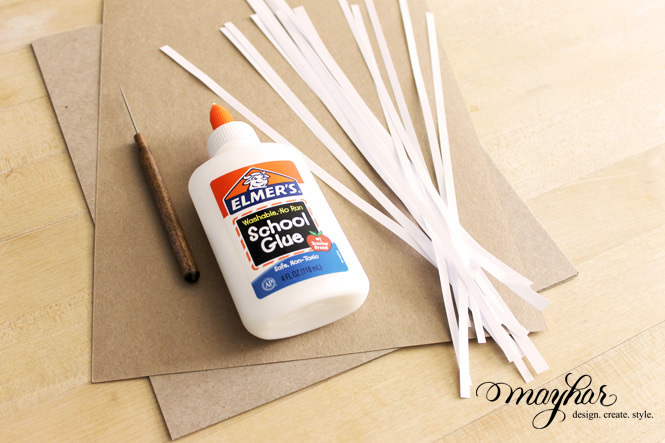 The glue should hold the roll together on its own while it dries. (9)Once your rolled strips have dried, you are free to apply them to your card as you like! I do use Elmer’s glue for this. It will adhere better. (10) Please look up additional images of quilled artwork for inspiration, as there are so many beautiful options and details! And, when working with flat paper, consider multiple layers and color tones. You can add so much depth and dimension.